VTV.vn – Tỉnh Thái Bình hiện đã ghi nhận gần 18.000ha lúa mùa nhiễm bệnh lùn sọc đen. Từ cuối tháng 7, hiện tượng lúa lùn lụi đã xuất hiện rải rác ở nhiều đồng nhưng các cán bộ chuyên môn và bà con nông dân cho rằng lúa bị nghẹt rễ do ngộ độc hữu cơ nên chỉ tập trung xử lý bệnh lý này. Đến khi phát hiện bệnh lùn sọc đen diện tích lúa bị nhiễm đã rất lớn. Hiện nay, việc xử lý nhổ bỏ, tiêu hủy những khóm lúa bị bệnh nặng đang là vấn đề lớn đối với bà con nông dân. VTV.vn – Bệnh rầy lưng trắng trên lúa, bệnh bạc lá, đặc biệt là bệnh lùn sọc đen đang bùng phát mạnh tại Quảng Trị. 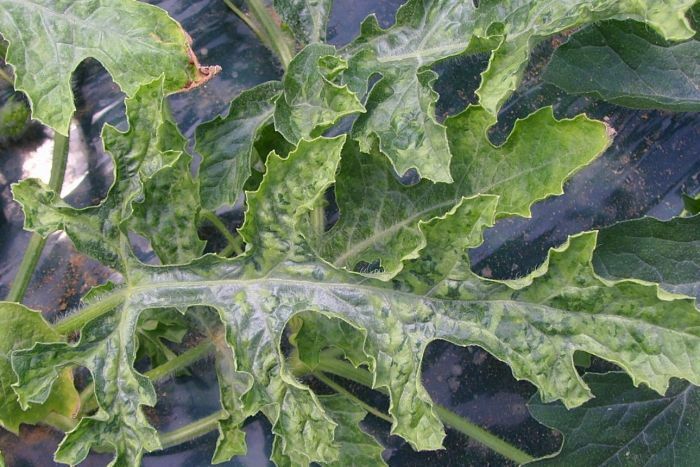 Cucurbit leaf crumple virus, a disease carried by whiteflies, infects vegetable plants like squash. Summer may have ended, but Georgia’s silverleaf whitefly infestation has not. Timothy Coolong, University of Georgia Cooperative Extension vegetable specialist, researches whitefly management in an effort to prevent the pest from infecting Georgia’s vegetable crops with viral diseases, like cucurbit leaf crumple virus and tomato yellow leaf curl virus. High populations of whiteflies over the past few years had a tremendous impact on Georgia’s vegetable crops in both the spring and the fall, said Coolong, who is part of a team of plant pathologists and entomologists that studies different fertilizer treatments, plant growth regulators and insecticides to control the influx of whiteflies. Whiteflies are found on vegetable plants, like yellow squash, zucchini and green beans. Last fall, Georgia vegetable growers lost 40 to 50 percent of their yellow squash production. Green bean growers saw similar production losses due to the cucurbit leaf crumple virus, a disease carried by whiteflies. Also known as “Aleyrodidae,” whiteflies are tiny, winged insects often found on the underside of leaves. They leave behind a tacky substance called “honeydew” that prevents plants from carrying out photosynthesis and causes fungal infections.Coolong and other scientists on the team tested several treatments on yellow squash and zucchini in an attempt to make the plants grow fast enough to tolerate the virus, which might prevent whiteflies from swarming. One application focuses on high fertilizer rates and another uses gibberellic acid to promote foliar development early in the growing process. “Researching different control methods for whiteflies is important, not only because of the direct damage they can do to crops, but to stop the viruses that they can spread,” Coolong said. Early control is key to prevention of the viruses spread by whiteflies. Farmers must proceed with caution in working on some of the most susceptible crops because of the losses that have been sustained the past two years, according to Coolong. Whiteflies thrive in warm, humid climates, and they reproduce quickly. The warmer-than-normal winter that Georgia experienced last year helped whitefly populations multiply. In normal years, Coolong recommends using insecticides as a management tool. Given the current conditions in Georgia, he warns growers that they may not completely wipe out the whitefly population with insecticides alone. Planting an unimproved variety of peanut in Uganda was a recipe for disaster this year. Groundnut rosette disease (GRD), an aphid-borne virus that causes mottling and affects much of sub-Saharan Africa, took 80% to 100% of the yield in some fields planted with a traditional variety. The difficult season made farmers even more interested in two recent field-day events held in Uganda, where they could see the results coming from fields planted with improved varieties resistant to GRD. Farmers check out peanut-growing guides at one of two recent Field Day trainings in Uganda. One woman, a farmer named Adong Christine borrowed $7,000 from a bank and planted 20 acres with a local variety. At the end of the season, she harvested just two bags of peanuts (from a potential 400 bags) and could not repay the loan. “There had been an outcry of big losses as most of the capital were borrowed from loan institutions. This event showcasing improved groundnut varieties therefore was timely as it restored hopes and enhanced adoption,” organizers said. David Okello, the head of Uganda’s national groundnut research program and a leading scientist on PMIL’s breeding project, is behind many of the varieties. Based at the National Semi-Arid Resources Research Institute (NaSARRI) in Serere District, Okello works to create varieties that are high yielding, resistant to drought and GRD, and to educate farmers about practices that will give them more success with their peanut crop. Peanuts are a traditional crop in Uganda and much of sub-Saharan Africa, are high-protein and valuable as a cash crop. Still, GRD is a persistent problem that stunts the growth of otherwise healthy plants and can destroy a crop if the disease strikes early enough in the season before flowering. A woman farmer picks up some bags of seed at Field Days in the Nwoya District of Uganda. At the end of a particularly bad season for disease, many farmers made the investment to buy small bags of improved seed. At one of two field days, 61 farmers, researchers and representatives of local government visited a 5.6-acre plot planted with three varieties bred for their resistance to GRD and leaf-spot, Serenut 9T (Aber), Serenut 14R and Serenut 5R. While participants could see for themselves the success of the varieties, farmers in the Loyo Kwo group, who are using the new varieties, explained their agronomic practices, where they get seed and how NaSARRI trainings helped improve their results. Leoora Okidi (centre) shows her approval of the high yield of Serenut 11T, an improved variety during a Field Day in August 2017 in the Kiteny Pader District of Uganda. Farmers were able to buy small packs of .5 kg to 3 kg., and the NaSARRI team delivered 45 kgs of Serenut 8R (Achieng), a large-seeded red variety that had been previously promised. In a second field day, farmers spent part of a religious holiday – the Assumption of the Virgin Mary to Heaven – visiting test plots, learning about improved production practices and visiting a farm where the owner planted Serenut 5R and Serenut 11T alongside the local Red Beauty variety. A crowd of farmers fan out over a field at a recent Field Days event comparing the yield and disease resistance of improved lines and varieties over the traditional, unimproved types, which have been ravaged by rosette disease this year. The farmer, Leonora Okidi, planted 2 of her 5 acres with an improved variety, and the other 3 acres with the local variety. She abandoned the local variety after the first weeding since most of the plants had been severely attacked by the rosette virus. In a good year, she is able to feed and educate her 11 own children and support 25 others from her groundnut operation, which is part of a women-led group called Pur Lonyo or “Farming is Wealth,” she said. Okidi first connected with Okello through her son, who he mentored in his diploma and bachelor’s degree studies and still supervises in his current master’s degree studies. She offered land to host demonstration plots and participatory variety trials and co-funded the operations using her family labour. Researchers have discovered how a severe rice virus reproduces inside the small brown planthopper, a major carrier of the virus. A small brown planthopper — a member of a species known for being a major carrier of rice stripe virus — feeding on a rice plant. Researchers from the Chinese Academy of Sciences’ Institute of Zoology have discovered how a severe rice virus reproduces inside the small brown planthopper, a major carrier of the virus. 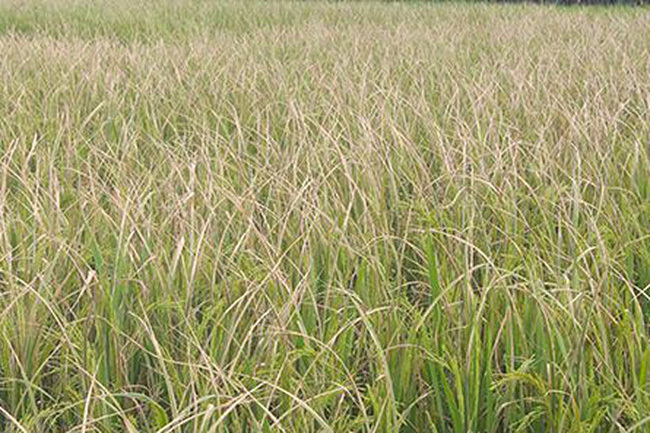 Rice stripe virus (RSV) causes major damage to rice crops each year. The study could inform future strategies for controlling the spread of this and other viruses that can lead to devastating effects on rice, wheat, cotton and other crops. Viral infections in animal hosts activate a pathway by which a type of enzyme, called c-Jun N-terminal kinase (JNK), is signalled to respond. But how exactly viruses regulate this pathway in vectors remains an open question, and Cui says the answer would provide important clues for intervening in the spread of plant viruses. To address this question, Cui and her team explored the effect of RSV on the JNK signalling pathway in the small brown planthopper. Studying interactions between proteins, and using an analytical method to determine the compounds that are important for the JNK signalling pathway, they found that the virus activates the pathway in various ways — especially through the interaction of a planthopper protein called G protein pathway suppressor 2 (GPS2), and a viral protein called capsid protein. “The interaction between these two proteins promotes RSV reproduction inside the planthopper, ultimately leading to disease outbreak when the insect carries the virus among rice crops,” says first author and postdoctoral researcher Wei Wang. The findings suggest that inhibiting the JNK pathway, either by lowering JNK expressions, strengthening interactions with GPS2 or weakening the effects of TNF-a, could be beneficial for rice agriculture. Materials provided by eLifeyvtxvtcywxufvr. Note: Content may be edited for style and length. In the past two weeks, USDA’s Animal and Plant Health Inspection Service (APHIS) has released documents on proposals to release two genetically modified (GM) organisms: diamondback moths and a virus designed to control the citrus greening disease attacking the citrus industry. Diamondback moths are a global pest of cruciferous crops such as broccoli, Brussel sprouts and cabbage. On April 18, the USDA released a draft environmental assessment of a proposed experiment by a Cornell entomologist with GM diamondback moths. You can read the full assessment which concludes it will have no harmful effects here. A Florida nursery, Southern Gardens Citrus Nursery, is proposing the release of a GM virus, Citrus tristeza virus, which has been engineered to express bacteria-fighting proteins found in spinach. The GM virus, which has been undergoing controlled field tests since 2010, would be grafted — not sprayed — onto citrus trees in Florida. USDA has announced its intent to launch an environmental impact statement on Southern Garden’s proposal. 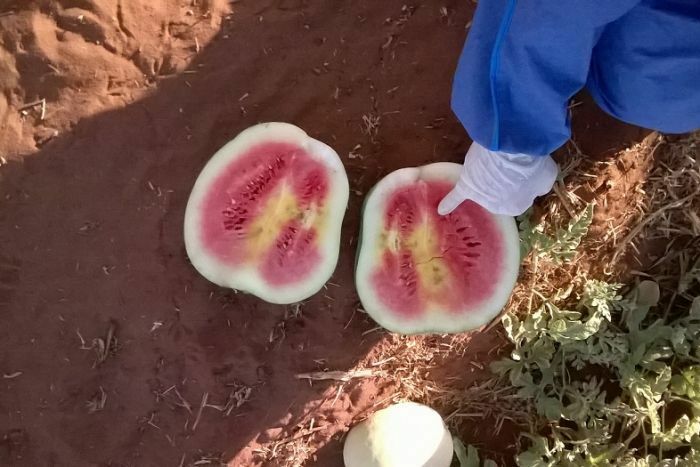 Biosecurity authorities are trying to figure out how a fruit and vegetable rotting disease broke out in Queensland, but have initial suspicions it was through imported seed. Farmers from the Bundaberg region are angry cucumber green mottle mosaic virus (CGMMV) has recently been discovered on five local properties, owned by two growers. CGMMV causes internal rot and discolouration in some cucurbit family fruit and vegetables, and its discovery comes months after an outbreak of white spot disease decimated the aquaculture industry in south-east Queensland. 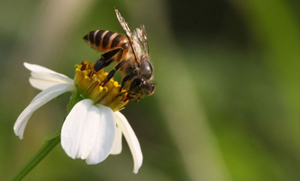 Biosecurity Queensland spokesman Mike Ashton said the virus was not harmful to humans, but could ravage parts of the agriculture industry if a widespread outbreak occurs. He said there was a possibility the virus was brought onto the infected farms by imported seeds. That is considering the businesses operate independently and do not share personnel and equipment. “That kind of increases the risk that perhaps it was seed that was the source of the introduction,” he said. Farmers like Gino Marcon are angry there has been an outbreak of another virus, and are switching to less risky crops. Outbreaks of tomato potato psyllid, chestnut blight and cucumber green mottle mosaic virus are among those having an impact on Australia’s horticulture industry. 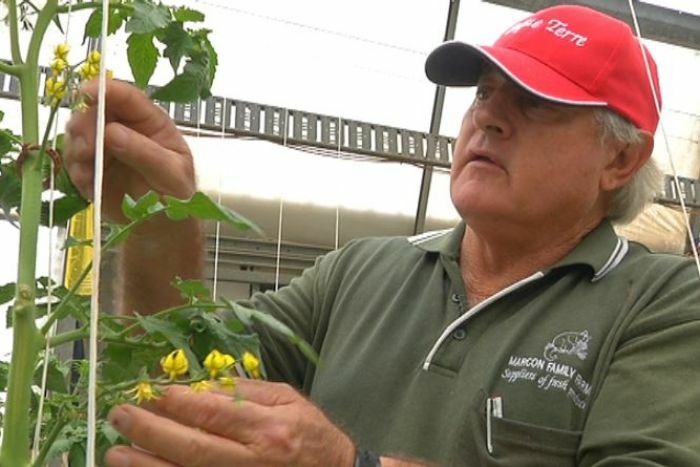 Mr Marcon normally grows a wide range of vegetables on his farm, but this year, he is only growing tomatoes to avoid CGMMV. “We’ve actually stopped growing cucumbers, we’ve sort of got a wait-and-see attitude at the moment,” Mr Marcon said. He blamed biosecurity authorities for the outbreak. “We’ve lost confidence in the system and that’s the biosecurity system,” Mr Marcon said. “We think it’s not broken, it’s shredded to bits. It’s simply not working. “I think the whole system needs to be overhauled, we’re not getting value for money for the money being allocated to biosecurity. Mr Ashton rejects the allegation that the system has failed. “We have managed to restrict the disease to a very small number of properties in Queensland,” he said. There have been previous outbreaks of CGMMV in the Territory and WA, and an isolated case at Charters Towers in North Queensland in 2015. 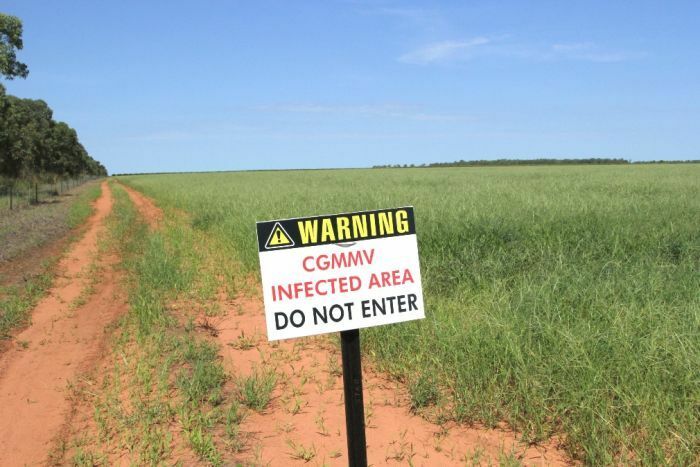 Biosecurity Queensland hope the Charters Towers farm will be declared clear of the virus later this year. The Federal Agriculture Department introduced mandatory imported seed testing to try and combat CGMMV in 2014. In a statement, the department said it uses a sample size more than four times the size (9,400 seeds) than that used internationally (2,000). It said that gave a high level of confidence in the results.